Twin wall or multi-wall polycarbonate (PC) is a low-cost, lightweight, highly durable, weather and UV-resistant plastic material perfect for use in awnings, patios, greenhouses and numerous other architectural applications -- indoor and out. ABS (acrylonitrile butadiene styrene) – Electronic equipment cases (e.g., computer monitors, printers, keyboards), drainage pipe. 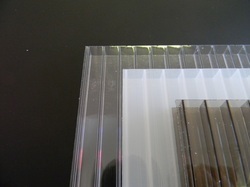 Acrylic or PMMA (polymethyl methacrylate) – One of the most familiar plastics to most consumers; used for displays, windows. HDPE (high-density polyethylene) – Detergent bottles, milk jugs, and molded plastic cases. HIPS (high-impact polystyrene) -: Refrigerator liners, food packaging, vending cups. LDPE (low-density polyethylene) – Outdoor furniture, siding, floor tiles, shower curtains, clamshell packaging. PA (polyamides) or nylons – Fibers, toothbrush bristles, tubing, fishing line, low strength machine parts: under-the-hood car engine parts or gun frames. PC (polycarbonate) – Compact discs, eyeglasses, riot shields, security windows, traffic lights, lenses. PC/ABS (polycarbonate/acrylonitrile butadiene styrene) – A blend of PC and ABS that creates a stronger plastic. Used in car interior and exterior parts, and mobile phone bodies. PE (polyethylene) – Wide range of inexpensive uses including supermarket bags, plastic bottles. PE/ABS (polyethylene/acrylonitrile butadiene styrene) – A slippery blend of PE and ABS used in low-duty dry bearings. PES (polyester) – Fibers, textiles. PET (polyethylene terephthalate) – Carbonated drinks bottles, peanut butter jars, plastic film, microwavable packaging. PP (polypropylene) – Bottle caps, drinking straws, yogurt containers, appliances, car fenders (bumpers), plastic pressure pipe systems. PS (polystyrene) – Packaging foam/"peanuts", food containers, plastic tableware, disposable cups, plates, cutlery, CD and cassette boxes. PU (polyurethanes) – Cushioning foams, thermal insulation foams, surface coatings, printing rollers (Currently 6th or 7th most commonly used plastic material, for instance the most commonly used plastic in cars). PVC (polyvinyl chloride) – Plumbing pipes and guttering, shower curtains, window frames, flooring. PVDC (polyvinylidene chloride) or SaranWrap – Food packaging. * Details courtesy of Wikipedia and our in-house experts!